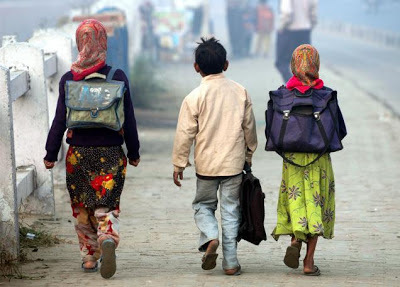 A recent research paper, "An Analysis of Education in Gujarat" by Sourindra Ghosh, has reached the drastic conclusion that though traditionally Muslim literacy rate in Gujarat has been better than the all-India average, in recent years it is showing a very slow increase. In fact, if the researcher is to be believed, "Gujarat's Muslim literacy rate relative to overall literacy" has lately experienced a decline. Ghosh, who works with Sewa Bharat in New Delhi, and has extensively been involved in several education related research works, says, "According to Census, in 2001 Muslim literacy rate was 73.5 per cent", which was higher than the overall liveracy rate of 69.1 per cent. However, "according to the National Sample Survey Organisation's (NSSO's) 64th round figure, Muslim literacy rate in Gujarat increased marginally to 74.3 per cent, resulting in worsening off of Muslim literacy rate compared to Gujarat's overall literacy rate of 74 per cent at that time." The research paper finds its way in a recent authoritative study, "Poverty amidst Prosperity: Essays on the Trajectory of Development in Gujarat", edited by Prof Atul Sood of the Jawaharlal Nehru University, New Delhi. The study is a collection of a dozen research articles on Gujarat. The researcher believes that an analysis of the Muslim literacy rate acquires significance in view of what he calls "Muslim minority question in Gujarat" becoming one of the "burning issues of our national discourse." Hence it "demands a special attention", even as analysing the educational status from the gender and caste perspective. The author says that while overall literacy rates of Muslims in Gujarat may be better than the correspending figures for the country as a whole, things are really worse off for its poorer sections. Ghosh says, in Gujarat's rural regions, the "literacy rates of non-upper caste Muslims (that is, SCs, STs and OBC Muslims) is lower than the corresponding all-India figure." Quoting NSSO figures, the author adds, these are 57.38 per cent for non-upper caste Muslims of the rural areas as against the corresponding figure of 59.71 per cent for the country as a whole. As for urban areas, the corresponding figures for Gujarat are 80.67 per cent, while these are 71.97 per cent for the country as a whole. The average comes to 67.44 per cent for Gujarat and 63.85 per cent for the country. What is even more interesting is that at the school level percentage of Muslims attending educational institions in Gujarat is lower than the overall state average. Thus, 89.1 per cent Muslims attend school in the age group 6-10 age group, while the state average for all the social groups is 92.5 per cent. In the age group 11-14, this gap drastically goes up in Gujarat -- just about 60.4 per cent Muslims attend school as against the state average of all social groups of 79.3 per cent. What is further interesting is that at the all-India level 71.6 per cent of Muslims attend school in the age group 11-14 -- suggesting a huge gap of 11.2 per cent. again. Ghosh says, the analysis suggests that the social disparities are "more often than not are are higher in Gujarat regarding educational outcomes, participation and access" as compared other "progressive states", as well as the all-India level. His data, in fact, suggest that it is not just Muslims who are at the receiving at as far as education is concerned. The situation is true for other backward sections as well. Gender disparities are very sharp, in fact sharper than Haryana, which is known for gender disparities. To quote the researcher, "In Gujarat male literacy rate stands at 84.75 per cent as compared to 64.8 per cent for the females. The difference is thus of 20 percentage points which is higher than the gap in literacy at the national level. This gap is higher in Gujarat in comparison with similar states like Haryana, Maharashtra and Tamil Nadu." He adds, what is equally disconcerting is that the gender gap is even higher in Gujarat than these states both at the primary and above primary level school going children.